TAZARA: Train operations in Tanzania to resume after strike action! The Tanzania-Zambia Railway Authority (TAZARA) has informed the public that, following the decision of the Labour Division of the High Court of Tanzania on 26 May 2014 to declare the strike by the Tanzanian employees of TAZARA as illegal, passenger cross-border operations between Zambia and Tanzania resume today (30 May 2014). Freight operations between the two countries have already commenced. The unionised workers of TAZARA in Tanzania withdrew their labour on 12 May 2014, demanding unpaid salaries for February (in some cases) and for March and April 2014. As a consequence, the railway suspended both freight and passenger operations between Dar es Salaam and Tunduma. According to the latest statistics released by the Department of Environmental Affairs, South Africa has lost 419 rhinos to illegal poaching since the beginning of 2014. Of the rhinos poached, 272 rhinos were killed in the Kruger National Park, 48 in Limpopo, 41 in KwaZulu Natal, 26 in the North West, 14 in Mpumalanga, 10 in the Eastern Cape, 4 in the Free State, 3 in Gauteng and 1 in the Western Cape. A total of 119 people have been arrested for rhino poaching-related offences in South Africa since January this year. According to the World Wildlife Fund (WWF), researchers have discovered the longest-known terrestrial migration of wildlife in Africa. They observed a previously unknown multi-country migration of Burchell’s zebra (Equus quagga) taking place entirely within the Kavango Zambezi Transfrontier Conservation Area (KAZA) – the world’s largest multi-country conservation area. Over two consecutive years the researchers tracked the movement of zebras back and forth by using GPS collars. The data show that the mammals are making a 500km round-trip between the Chobe River in Namibia and the Nxai Pan National Park in Botswana. Continued long-term research will be needed to confirm that this is an annual and fixed migration, and whether this is genetically coded or passed behaviorally from mothers to offspring. The distance covered by the Burchell’s zebra in the KAZA is greater than that covered by wildebeest (connochaetes taurinus) during their well-known seasonal journey in the Serengeti ecosystem, which is located in north Tanzania and south-western Kenya. Braamfontein, located north of Johannesburg's city centre, is one of the top must see spots in South Africa's largest city. The suburb, which used to be a thriving business district until the late 1980's, experienced urban decay during the 1990's and was only regenerated through a massive investment by the city in the early 2000's. The Braamfontein of today is a commercially and culturally diverse business district, which compromises a mix of office blocks, student accommodation, restaurants, retail outlets, colleges, theatres and hotels. Protein, an international advertising agency, recently published a video guide of Braamfontein, that will definitely put "Brammies" on your bucket list for South Africa. Kudos Protein! According to a news release regarding the end of the sixty-seventh session of the World Health Assembly (WHA) issued by the World Health Organisation (WHO), the decision making body of the WHO has lifted the 10-year yellow fever jab limit and made yellow fever vaccinations a once-in-a-life time requirement. If you are currently planning to travel along the Wild Coast, the following video by Byron Wigmore gives you some great ideas how to spent your time there. Byron filmed the video with a GoPro Hero 3: silver editon. Kudos Byron! The Wild Coast, which formed part of the Transkei until 1994, stretches from East London in the south to the border of KwaZulu-Natal in the north. Popular tourist towns and villages along the Wild Coast include Port St Johns, Coffee Bay, Hole in the Wall, Kei Mouth and Chintsa. During Apartheid, the Transkei was an independent homeland politically and economically independent of South Africa. According to the latest statistics released by the Department of Environmental Affairs, South Africa has lost 402 rhinos to illegal poaching since the beginning of 2014. Of the rhinos poached, 266 rhinos were killed in the Kruger National Park, 41 in KwaZulu Natal, 39 in Limpopo, 26 in the North West, 12 in Mpumalanga, 10 in the Eastern Cape, 4 in the Free State, 3 in Gauteng and 1 in the Western Cape. A total of 115 people have been arrested for rhino poaching-related offences in South Africa since January this year. The flag carrier airline of Tanzania, Air Tanzania, has reintroduced flights between Dar es Salaam (DAR) and Zanzibar (ZNZ) and between Dar es Salaam (DAR) and Arusha (ARK). According to news reports, the airline offers six frequencies a week to the two destinations and uses a Bombardier Q300 Turboprop on both routes. Air Tanzania currently serves eight domestic and two regional destinations, including Dar es Salaam, Zanzibar, Arusha, Kigoma, Mbeya, Mtwara, Mwanza and Tabora as well as Bujumbura (Burundi) and Moroni (Comoros). South African Tourism has released a new brand video named "Reconsider South Africa" on youtube. How do you like it? check-in counters with modern technology; airside shuttle bus service; ten immigration counters and three baggage carousels in the International Arrivals Hall; increased duty free and retail space; first-, business-class and smoking lounges; landside restaurants and coffee shops; banking facilities that accommodate Visa and MasterCard transactions; free WiFi; bureau de change; car hire and taxis services. update (27 Nov 2014): According to nehandaradio.com, the expansion works at Victoria Falls International Airport (VFA) are now expected to be finised by August 2015 due to construction materials procurement bottlenecks. update (22 Oct 2014): According to newzimbabwe.com, the completition of the refurbishment of Victoria Falls International Airport (VFA) will be delayed by three months after the contractor requested an extension. The Civil Aviation Authority of Zimbabwe (CAAZ) expects the all the project works to be completed by June 2015. Victoria Falls International Airport (VFA), located about 18km south of the town of Victoria Falls in Zimbabwe, is currently undergoing a massive expansion project. The project started in April 2013 and should be completed in April 2015. It is expected to cost US$150 million in total. As of April 2014, the expansion proect is, according to news reports, on schedule with the runway 41% done while the terminal building is 23% complete. South Africa: Sani Pass gets fully tarred within the next five month! The famous Sani Pass, located in Western KwaZulu Natal, is getting fully tarred. The road, famed for being a great, but notoriously dangerous, 4x4 vehicle drive, links Underberg in South Africa with Mokhotlong in Lesotho. The route up Sani Pass starts at 1544m and climbs 1332 vertical metres to an altitude of 2876m. The first phase of the upgrade of the gravel road to tar has already been completed, with 14km of the road now fully tarred. The construction of the remaining 5km will begin within a five month period from 21 May 2014, if there are no further appeals. The total cost of upgrading the 19km from Old Good Hope Trading Post to the summit of the Sani Pass at the border post to Lesotho is expected to cost R887m. The Hardap Camp, located in the Hardap Recreation Resort just out of Mariental in south-central Namibia, is finally under renovation. The Camp, owned by Namibia Wildlife Resorts, is closed for redevelopment since 31 May 2011. The renovation of Hardap Camp is expected to N$57 million. We'll keep you posted as soon as we get some more info about the work to be done. Hardap Recreation Resort (252km²) is situated at the Hardap Dam, which dams the Fish River and has a surface area of 25 km². With many inlets and small islands Namibia's biggest reservoir provides a safe breeding place for 284 bird species including the great white pelican, yellow-billed stork, osprey, Bradfield’s swift and Stark’s lark. The Hardap Recreation Resort is also home to Black rhino, kudu, gemsbok, Hartmann’s mountain zebra, springbok and red hartebeest. update (10 June 2014): According to news reports Zambia and Zimbabwe have agreed to launch a joint visa scheme by August 2014. According to various news reports, the governments of Zambia and Zimbabwe have agreed to launch a joint visa scheme in June 2014. Through implementing the seamless visa the two countries expect to increase international tourist arrivals between the two countries. 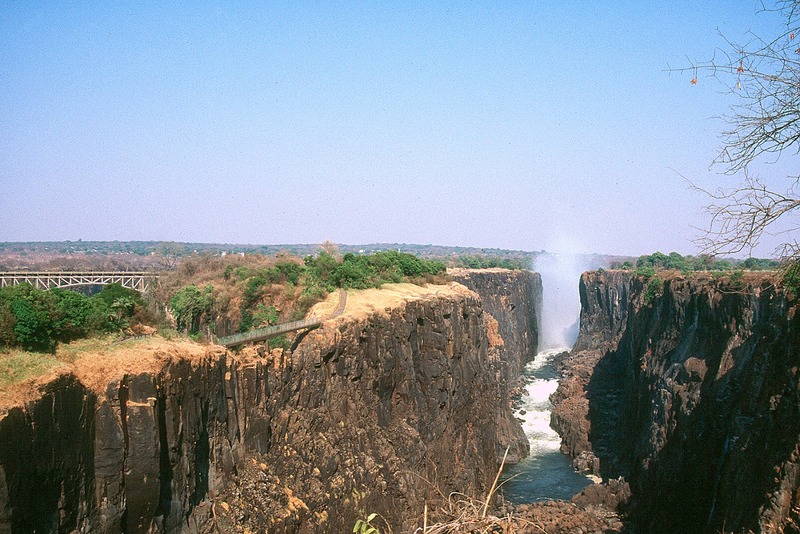 During the United Nations World Tourism Organisation 20th general assembly in August 2013, which was co-hosted by Zambia and Zimbabwe and took place in Livingstone and in Victoria Falls, both countries successfully ran a pilot project to test the joint visa scheme. We'll keep you posted! 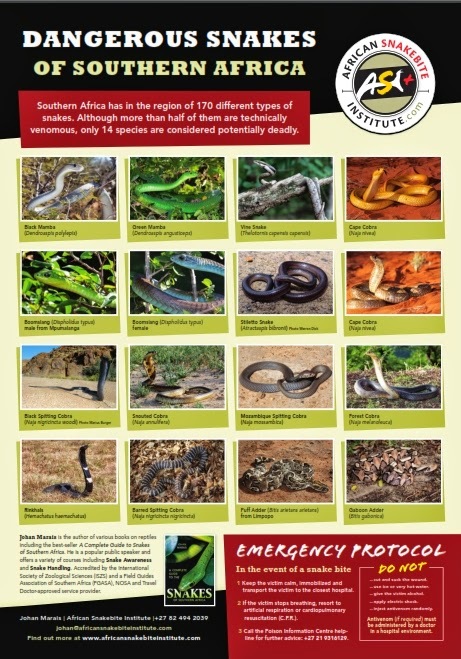 Free Posters: The Dangerous Snakes of Southern Africa, Gauteng, KwaZulu Natal & the Western Cape! Herpetologist Johan Marais, author of "A Complete Guide to Snakes of Southern Africa" (available in South Africa via kalahari.net), has put together posters of the dangerous snakes of Southern Africa, Gauteng, KwaZulu Natal and the Western Cape. We got them as a high-resolution pdf from him and - thx to Johan - we can now share it with you for free! Kudos Johan! Click here to download it (pdf, 2.6mb, A3) for free! Click here to download it (pdf, 6mb, A3) for free! Cape Town International Airport: Border control facilities got upgraded! Airports Company South Africa (ACSA) has spent a total of R4.7 million to upgrade the border control facilities at Cape Town International Airport (CTIA) in Cape Town. The new passport control area has been moved closer to the International Departures Duty Free area and now comprises of 14 counters for personnel as well as for the associated Department of Home Affairs role players. An automated queuing system has been installed to help manage queues and turn-style gates have been installed to ensure personnel and passengers entering the area are processed separately. All employees will now have to swipe their cards which will also assist in preventing tail gating. The emigration office opens at 04h00 and closes after the last flight (this is inclusive of delayed flights) daily. Its been a while since we last featured a backpackers, or hostel, on our blog. Well, today's hostel is truly one of the great backpacker spots in Cape Town. Penthouse on Long has been around for years and has build up a reputation of being one of the top hostels in the city. Located right on Longstreet, actually six floors above Longstreet, the hostels offers mixed dorms, a girl only dorm, private rooms, double & twin rooms, a triple room, a family room and, of course, a roof top bar, from which you have 360 degree views of Cape Town, both day and night. WiFi is available at Penthouse on Long, as well as a 24-Hour reception, a safe-deposit box, a laundry service, bicycle rental and much more. Kruger National Park: First poached elephant in ten years! update (23 May 2014): An interesting read, researched by Julian Rademeyer: "Kruger elephant poaching incident is not ‘the first in more than ten years’". South African National Parks (SANParks) yesterday confirmed the first confirmed elephant poaching incident in the Kruger National Park in well over ten years. According to SANParks Rangers Corp Officer Commanding, Major General (Ret) Johan Jooste, forensic evidence suggests that this elephant bull was purposefully shot for its tusks, which were hacked off and carried away by suspected poachers. Investigations are currently underway. 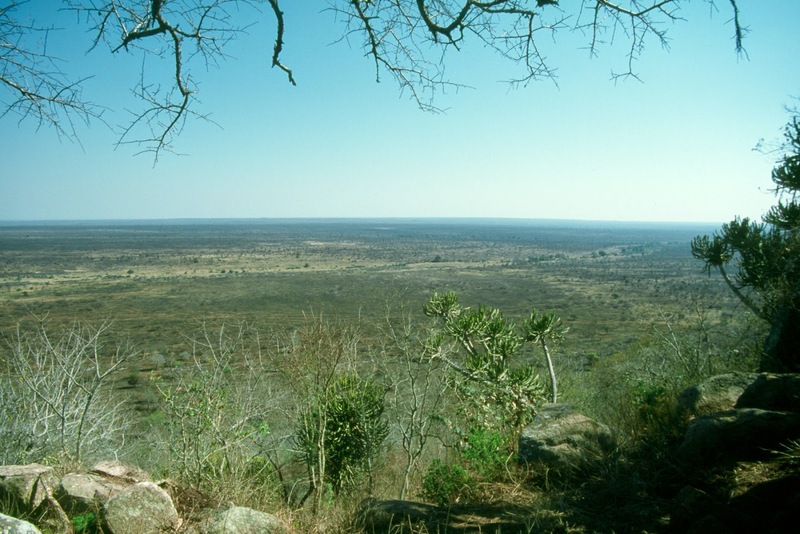 The incident occurred in the Pafuri region, in the northern part of the Kruger National Park. The flag carrier airline of the United Kingdom, British Airways, operates an Airbus A380 between London and Johannesburg since February 2014. To celebrate the new service to South Africa on board the world's largest passenger carrier, the airline features Cape Town in its latest Airbus A380 promotional video. In the video you can see an Airbus A380 flying right over the city's iconic Table Mountain, Boulders Beach and the world famous Cape Winelands. British Airways' Airbus A380 direct service to Johannesburg is the third destination to have the world's largest commercial passenger aircraft, after Los Angeles and Hong Kong. The airline has also increased its schedule to Cape Town this winter, and flies 10 times a week. btw - British Airways not only features Cape Town in the video, but also Imagine Dragons 2013 hit single "On Top of the World" covered by South African multi-award winning Afro-fusion band, Freshlyground. Enjoy! Most travellers coming to Southern Africa from overseas probably don't expect to go skiing or snowboarding in this part of the world. But hey, why not? AfriSki Mountain Resort, for instance, is one of only two skiing resorts in Southern Africa that offers winter skiing and snowboarding each year by way of natural and man-made snow to all from beginners to advanced skiers and snowboarders. This year's winter season at AfriSki, which is located 3,322 m above sea-level in the Maloti Mountains in Lesotho, kicks of at 05 June 2014 and lasts until 31 August 2014. AfriSki Mountain Resort can be accessed from South Africa via the Caledonspoort Border Post at Fouriesburg. Once through the border post and into Lesotho, the scenic Moteng Pass leads you to the the Mahlasela valley at 3,222m above sea level. It takes about 90min from the border post to the AfriSki resort (mind the occasional potholes, speed limit 80km/h, distance: 73km). The border post is open daily from 06:00am to 22:00pm. Please fill up your car at Bethlehem or in the Lesotho town of Butha Buthe, just over the Caledonspoort Border Post. btw - the only other skiing resort in Southern Africa - besides the AfriSki Mountain Resort - is the Tiffindell Ski Resort in the Eastern Cape Highlands in South Africa. Go check it out! 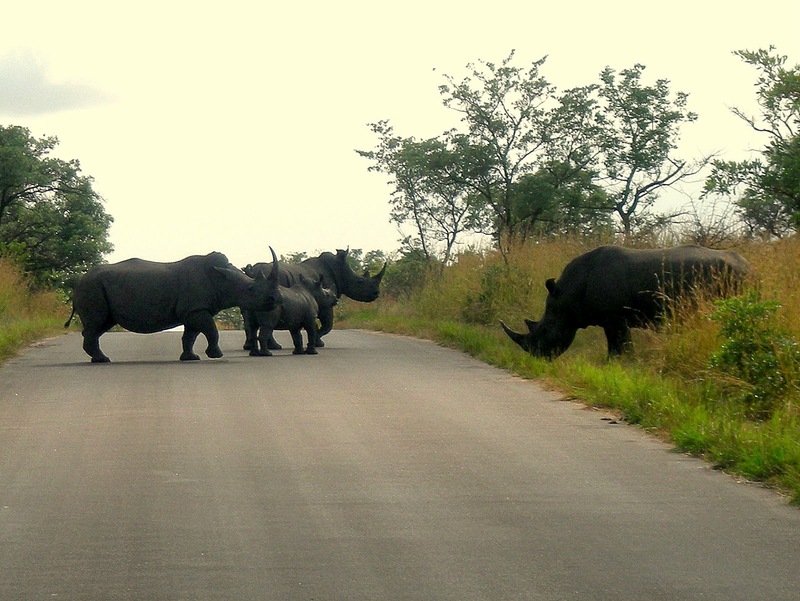 According to the latest statistics released by the Department of Environmental Affairs, South Africa has lost 376 rhinos to illegal poaching since the beginning of 2014. Of the rhinos poached, 245 rhinos were killed in the Kruger National Park, 39 in Limpopo, 37 in KwaZulu Natal, 26 in the North West, 12 in Mpumalanga, 9 in the Eastern Cape, 4 in the Free State and 1 in the Western Cape. A total of 106 people have been arrested for rhino poaching-related offences in South Africa since January this year.